Maasai people and their life is the focus of the discussion forum this Sunday at the Gallery & Space at Plaza House. The Maasai people are one of the best-known ethnic groups in Africa, who live in southern Kenya and northern Tanzania. They have become familiar in the west because their living area is near the many wildlife parks in the eastern Africa, and their distinctive customs and dress. The third floor Gallery & Space at Plaza Shopping Mall is organizing a seminar and discussion event on Sunday, May 22, called “Jambo! 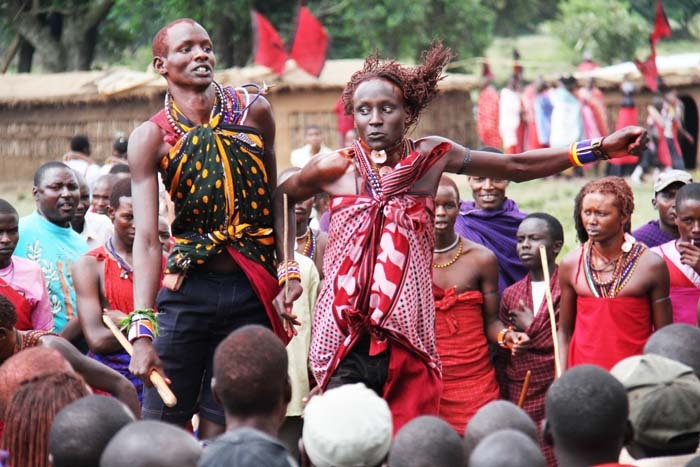 Africa!,” with the focus on Maasai people, their culture and what is happening in their homeland. The event starts at 13:00 with the doors opening at noon. Tickets to the event are ¥2,000 in advance and ¥2,500 at door. After the talk event, Okinawan musician Hiromi Kondo who traveled extensively in Kenya, Uganda, Tanzania, Zimbabwe and over 20 countries in Africa, will give a live performance playing piano. The Gallery & Space will also have an African art workshop called “Ting Tinga” that costs ¥600 to cover the materials. African crafts and accessories will be on sale during the workshop. A photo exhibition is open in the gallery until May 22nd from 11:00 to 19:00. Admission to the exhibition is free. All pictures are on sale with a part of the money going to Magoso School in the Kibera slum of Nairobi, Kenya, to support its operating costs.